Find the price of items excluding tax for European countries. Is there a better alternative to Ivano? Is Ivano really the best app in Internet Utilities category? Will Ivano work good on macOS 10.13.4? 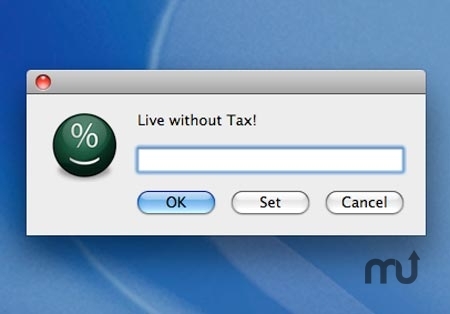 Ivano helps Mac users to find the price of everything without tax. For example, in a shop you see that the price of a Mac is Euro 1,200, but you know that there is 20% of tax (like Vat or Iva). How much does this Mac cost? Simply double click on Ivano, type 1200 and then clic OK. Ivano show the right price of the Mac and put in it on clipboard. Ivano is set for 20% of tax. For change this you can insert the right amount of tax (like 10, 15, 35) and then clic Set instead of OK. Ivano learn the amount of your tax and it doesn't ask you anymore. Ivano needs a review. Be the first to review this app and get the discussion started! Ivano needs a rating. Be the first to rate this app and get the discussion started!